The ballot for the Prudential RideLondon 2019 is now closed! If you were not successful or maybe forgot to sign up, not to worry – every year thousands of cyclists enter via a guaranteed charity place. This year, we’ve secured a limited number of spaces and we’d love for you to join our team and support our work to prevent child sexual abuse. If you would like to get involved and join our team Stop it Now! – download the application form here. Or don’t hesitate to get in touch at supporters@lucyfaithfull.org.uk or call us on 01372 847 160. On Sunday 4th August with the route closed to all traffic, around 25,000 amateur cyclists take on a cycling challenge like no other through London and Surrey – on a similar route to that of the London 2012 Olympic Road Cycling Races. The Prudential RideLondon-Surrey 100 will start in Queen Elizabeth Olympic Park, then travel through the capital and onto Surrey’s stunning country roads and through the Surrey Hills before a spectacular finish on The Mall in central London, shortly before 150 professional cyclists race in the Prudential RideLondon-Surrey Classic on a similar route. Since the event began in 2013, riders have raised £17 million for good causes. 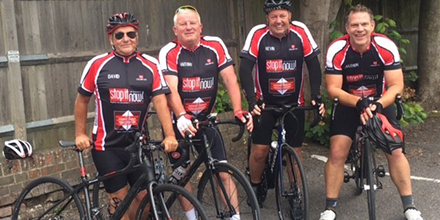 By joining our team, not only will you be raising awareness and making a real difference to lives of others, cycling on our behalf may just give you that extra motivation to make it through those final miles. If you have any questions or would like any further information please don’t hesitate to get in touch at supporters@lucyfaithfull.org.uk or call us on 01372 847 160. Whether you are applying for one of our charity spaces – or were lucky enough to secure a ballot space – we would love you to join team Stop it Now! Or, if cycling isn’t your thing, head to our fundraising page for ideas on how to kick start your own event in 2019. Whether you’re at home, in the office, or at university, there’s an endless amount of ways to raise money and have fun at the same time.